At last, 2017 Ninjago images! Judging by the number of tweets we have received asking when we will have pictures of next year's Ninjago sets, a lot of you will be pleased to hear that they have now surfaced, courtesy of our favourite French LEGO fan site Hoth Bricks. I have added box images to the database: you will find 'out-of-box' ones at Hoth Bricks. Awesome! Kai and Nya's parents, at last! They look great! I want destiny's shadow boat set. @randyhoar, there are no Super Heroes sets being released other than Batman Movie ones, until March and we believe Speed Champions will be April so we would not expect to see images of them yet, perhaps not until the toy fairs in January. Crossing my cash for the SW ones. @Huw: It would appear that the names for these sets don't match the names in the database. Was this some sort of translation error of a preliminary list in another language? Almost certainly. A db admin will be along to sort them out shortly I suspect. Some interesting looking new parts here. And enough snakes to make Indiana Jones wet himself. 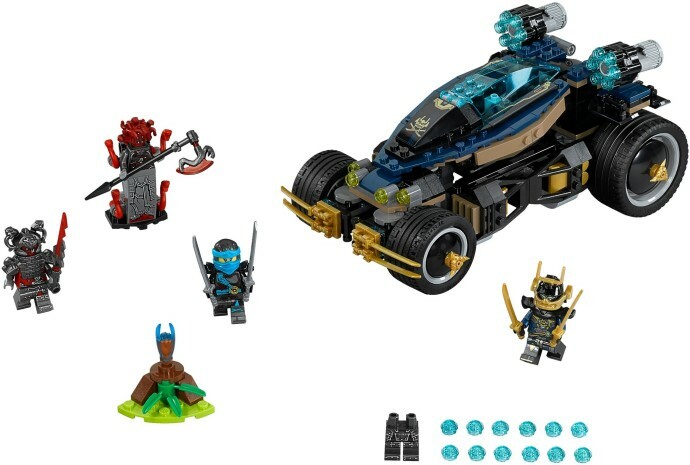 A lot of cool pieces, but the sets are all standard Ninjago stuff, so not for me! Come on, Lego! Come up with something new!!! Since when do you guys use the box art images as the main icon image for each record in the database?? I prefer the out of box ones. Will they be changed later?? Because they just look out of place considered that you have used the out of box ones everywhere else. Nothing stands out for me with these, was a big fan of the Skybound stuff, but not for me this new sub theme. I'd like to buy some of these for sure. Hope they aren't too expensive here. WHEN WILL THE SERPENTINE DIE!!!!!!! This is the third subtheme with snakes! We'll switch out the images when they appear on shop.lego.com. @Rob Philips: You might as well say "troopers again?" for a Star Wars set, or "soldiers again?" for a Pirates set! I'm interested in knowing the story behind these new baddies, but I can't hold it against LEGO for revisiting tropes that have served this theme well in the past, especially when these new bad guys feel decidedly unlike past snake-themed Ninjago factions. Overall there's a lot of originality in this new wave in terms of builds. The Dragon's Blacksmith is an excellent building with an amazing fusion dragon, Dawn of Iron Doom is a fearsome-looking machine, and Destiny's Shadow is a great new take on the Destiny's Bounty formula (this time as a skiff rather than a full-sized vessel). Even the more "high-tech" vehicles like Samurai VXL and Desert Lightning feel quite different from other sets we've seen recently. The Vermillion vehicles are extremely unorthodox with their blade-like, tracked designs and heavy use of Titanium Metallic. I can't quite tell what color the buildable figure blades are — I'm almost tempted to say they're some sort of copper, which is pretty exciting since there's no such color on the current palette! The box art for this wave, featuring Kai and Nya, is extremely well-designed, and the swampy setting adds further uniqueness. Overall, there's a lot to be excited about here! The new ninja costumes are fantastic, and I sort of get Bionicle Metru Nui flashbacks from their main colors (dark red, earth blue, earth green, dark stone grey, silver metallic, titanium metallic). This is the first of Nya's costumes not to have any shade of red as a major part of her color scheme, yet it still feels very "her". Wu seems to be the same as in Samurai X Cave Chaos except with a Brick Yellow (tan) hat, but it's been around five years since we last saw that hat in that color so I appreciate it anyhow. Besides, I don't think costume changes are as important for supporting characters like Wu as for the main six ninja. The cheapest set and the dearest set look great. Everything in between is dull for me. That Dragon is a must buy. Dragon is cool, I quite like the mid-range vehicles. Everything else? Eh. But massive points for trying, these sets seem very strange and well-designed over all, even if I don't like some of them. Ugh... Snakes: Why did it have to be snakes??? Wow, I suppose a remake of similar old design is the way to go now, how interesting! Wow, those minifigure villains look totally awesome. Those helmets, and body armour pieces. Those minifigs will be excellent for a fantasy medieval type castle theme. not into ninjago itself, but as with this year's steam punk, I'm seeing some VERY interesting pieces there for industrial MOCs. I thought Ninjago had ended last year, and even that was an extension. Ah well. Makes no mind to me. Love the armor and I am quite excited I can get some excellent figures in the cheaper sets. Really love the intricate metal work look on many minifigs. Passed on Ninjago this year but not next year! I haven't really been bothering with Ninjago for the last couple of themes. When they were up against ghost ninjas, I just picked up Wu's dragon, and when they were up against the sky pirates, I picked up the small set with Cole and his dragon. But the two-headed dragon aside (and it is a really cool looking dragon) nothing here really impresses me. I used to love Ninjago just for the figures (the villain figures were usually amazing), but even they haven't grabbed me lately. The only one that really grabbed me recently was the four-armed genie pirate captain, and he's so expensive on Bricklink that I never bothered. @lippidp: No, Ninjago didn't end last year — quite the opposite! Ever since it came back in 2014 it's been going quite strong, and last year LEGO declared it "evergreen", like LEGO City. It's one of their most popular themes, and they have plans for it for many years to come, including the LEGO Ninjago Movie next fall! OMG! OMG! OMG! Samurai armor! I have been waiting for a samurai armor for so long! (I don't like the standard plain one.) So many great settings and minifigs in this wave! Love it! Is it just me or does the text in the post contain a lot of sarcasm? @TWP: What makes you say that? I am not a huge Ninjago fan, I do have a few select sets that I think are just really cool, Temple Airjitzu being the main one. But, these look amazing! What are these new silver scaled textured pieces!? And that ship with the canoes on the sides, awesome. I'm liking Ninjago more and more. @ImagineCo125 The villain in this wave are not snakes, they are some kind of samurai figure. The reason there are snakes is because they are in the jungle(where a lot of snakes are) so these are not serpentine but instead are just normal snakes to give it that jungle/swamp feel. I am very excited for these sets! I have been rooting for ninjago since the very start and have loved an stayed with the theme ever since. Ninjago is a great theme and hopefully will live on for a long time! Notice in Dragon Forge, by the windows, the new curved tile pieces, introduced in 10255 Assembly Square, have been introduced in brown! So we should be expecting more of that piece in different colors! Very excited for the future of this theme and all of LEGO! Holy sh** they actually made minifigures of kai and nya's parents! And they are actually in a forge! Which makes sense because fire + water makes steam! And it's a blacksmith shop like in 2011. And yet another mech to collect. This time more snake-like, which is a surprisingly nice change. I just hope it's details look better in the flesh. And hopefully that set won't be too expensive. Also, I'm curious what those literal hands of time are doing on the mech. Is it a doomsday device countdown or something? And finally, that rogue hood in black! Ooh, and it's interesting to see that larger brick-built half snake figure appear twice. Looks cool! The gold samurai looks interesting. I have to disagree on nya looking distinct without the red though as it took me a while to realize she is in azure vs jay's blue and is thus a seperate character from the samurai. These sets look fantastic. This is such a great theme for new parts and recolored parts. There are too many to list. I think that the sets seem a little drab in these small pictures, but when you see these in hand the sets will pop. For me, the titanium metallic (pearl dark gray) is a great color, and many people will be glad to get that color for all the parts they show. I like it much better than flat silver. I built a mech in all titanium metallic and it looks great, I think it would be impressive if you could build a spaceship in titanium metallic. Those uruk-hai swords in copper looks awesome. I love all the sets, the vermillion armor and vehicles look really nice. It's a great theme but I wonder how long they can keep Ninjago going. They will need to come up with good stories for the TV show, reinventing itself over and over. These sets appear to bring little new stuff we haven't seen before. Another skip-year for me. The 2016 steampunk sets were great but these are all meh. Very cool wave! Nice colours, a lot of interesting parts, great looking villians, some crazy designs (Destiny's shadow) - I like it :). Does Samurai VXL have a steering? Wow, these look great! I don't collect Ninjago but given infinite budget and space these would make me change my mind about that. Haha, what's up with this subtheme called: "The Hands of Time"? :D Sounds pretty familiar with Prince of Persia! Some more Awesome Ninjago sets that I must have. My Wallet needed a holiday and now it will not be getting one. "our favourite French LEGO fan site"
"Webmaster Will has assured us, in English, that "These pictures were not obtained illegally, they were not stolen, nobody got hurt to get them."" The not quoting sources seems something brickset does not like. I like how these sets have some pedigree! Dawn of Iron Doom = good ol' Spyrius Robo Guardian #6949. LOVIN' it!! Vermillion design is amazing, new suits as usual, perfect, and by far the best looking suits. Cool sets, waiting to see how the show goes.